The cabin was a perfect little getaway for us! It was so cozy! It was even decorated for Christmas! We really enjoyed our stay! Loved the cabin and we had a great time. The screen door was off the track when we got there so we weren't able to use it. No big deal for us. And the cabin could use some lighting on the front walk. The only outside light was above the door, but getting around to it was pitch dark. We were fine and would stay again, but might check on these things for the next renters. LOVE LOVE LOVE everything about Enchanted Moments. We had beach reservations but thanks to Florence those were cancelled and we were left looking for somewhere to go for our 37rh anniversary. Booked it online a few days before we were to arrive. I was a little worried because it was so cheap. When we arrived we were more than pleased and can’t wait to go back. I don’t think we could have found a better place no matter where we looked and for the price I know we couldn’t!!!! Why don,t you get back part of your processing fee and all of your Damage Deposit !! Cabin was well taken care of--- both during and after stay. Processing done at office , not online !! Several of the blinds were broken, which greatly reduced privacy. Also, the bed desperately needs to be replaced, it was uncomfortable and unstable. The whole process was great and loved the getaway, just won’t return to that cabin again. The cabin was smaller than expected but was fine for a couple. The smoke detector was broken and half was laying on kitchen counter, with the recent fires that made me feel uneasy. The water smell was HORRIBLE. While we understand that it’s well water and some wells have a odor thus odor was out of control, the water has s horrible sticky grimy feel as well. The threshold under the main door was broke and 1-2 inch gap was very noticeable, we had to put a towel there, any small crawling animal could have made its way in very easy. Also DVD player was missing several cords only allowing movies to be played in black and white. Thank you for taking the time to let us know about your recent stay in Enchanted Moment! We here at Cabins USA work hard to make sure each of our guests have the same great stay you enjoyed while vacationing in the Smokies. Thank you for letting us know about the inconveniences you experienced. Your comments have been forwarded to the appropriate department to be addressed. When you are ready to stay with us again, please mention you are a return guest for an additional discount. Thank you again for your review and thank you for choosing Cabins USA! Enjoyed my stay. Had 2 minor problems but they were addressed.Also come about an hour early before check in so you find your cabin it took us 30 Mona to find it. The cabin was great. It was cozy. Just for two it is ideal. Our only concern was the bottom of the door meeting the threshold. There is a gap of about half to three quarters of an inch that needs addressing. Creepy crawlers can get in. A little more privacy between cabins would be nice too, with regards to the hot tub. Over all, we had a great time. Will stay again. Thank you for taking the time to let us know about your recent stay in Enchanted Moment! We here at Cabins USA work hard to make sure each of our guests have the best stay possible while vacationing in the Smokies. Thank you for letting us know about the door. Your comments have been forwarded to our maintenance department to be corrected. When you are ready to stay with us again, please mention you are a return guest for an additional discount. Thank you again for choosing Cabins USA and we look forward to seeing you again soon! Had a weekend getaway and the cabin was perfect just for that. Very clean, hot tub was hot and ready when we got there. Within minutes from town but far enough way to not hear traffic. Will definitely stay again. I am so happy to hear that you enjoyed your stay in Enchanted Moment! We here at Cabins USA work hard to make sure each of our guests have the same great stay you enjoyed while vacationing in the Smokies. When you are ready to stay with us again, please mention you are a return guest for an additional discount. Thank you again for your review and thank you for choosing Cabins USA! The place was great and just the perfect size for the weekend for 2 people! Five minute drive from the main Parkway and Apple Barn. Early check in online was a breeze and checking out was even easier. The staff answered every question and we were able to reach a representative immediately. The hot tub wasn't as private as the pictures seem but it was enough for the short time and it was so relaxing. To be honest the bed is quite uncomfortable. It slopes in the middle and seems pretty old. BUT other than that, the cabin and location was great and we would definitely book with the company again. Thank you for taking the time to let us know about your recent stay in Enchanted Moment! We here at Cabins USA work hard to make sure each of our guests have the best stay possible while vacationing in the Smokies. Thank you for letting us know about the condition of the bed. Your comments have been forwarded to our Owner Liaisons and they will be bringing this to the owner's attention. Thank you again for your review and thank you for choosing Cabins USA! If you're looking for a quiet place for 2 that's still very close to Sevierville and Pigeon Forge this place is for you. We had to clean out about 25 stink bugs but other than that it was very clean. My wife and I loved it! Thank you for letting us know about your recent stay in Enchanted Moment! We here at Cabins USA work hard to make sure each of our guests have the same great stay you enjoyed while vacationing in the Smokies. I apologize for the insect issue you experienced. Your comments have been forwarded to our housekeeping department to be addressed. When you are ready to stay with us again, please mention you are a return guest for an additional discount. Thank you again for your review and thank you for choosing Cabins USA! We loved our stay, but had only a couple of things we wanted to let you know about. More in the hands of maintance. The sliding glass doors screen fell plum off the tracks the first time I opened it. The grill would not light, but we did get it started with a lighter and only 2 burners works. The main door has about a 1 inch gap underneath it which allowed many bugs inside until we rolled up a towel to use as a blocker. I was trying to catch the stray kitten under the house and noticed water leaking from the porch where the hot tub sits. The hot tub did not seem low on water though and was perfect! Again, this would not prevent us from coming back, we would just like to see needed attention go towards your beautiful cabin. Thank you! My husband and I had a great time staying at this cabin and will stay again in the future. Only complaints are that the blinds were all broken and pieces missing, had to have someone come fix them for privacy issues. The smoke detector was missing off the wall and laying on the kitchen counter. And the hot tub was ice cold when we arrived and it took forever for it to heat up. Also there could be more lighting around the hot tub. The Wi-Fi did not work at all. So in the future may want to start checking some of those things, people pay a lot of money to stay there. Other than that it was great and we will be back. The cabin was very comfortable and a perfect size for just the two of us. There were a few complaints, but over all, we enjoyed our stay. First of all, there were several sets of broken blinds in the windows. Some had broken pieces where someone could see in, others were broken and rigged to stay up, and some couldn't even go all the way down. The ones over the back door had no handle, and the back sliding door was off track and we couldn't even get it unlocked. Also, (which may be from a fault of ours) there was no pan of any sort. They had pots and skillets, but nothing that you could put in the oven. My girlfriend got freaked out about there being ants all over the hot tub cover, but I guess that's what you get when you're in the middle of the mountains. Also, we didn't like that we would've had to drive into town to the office in order to get some clean towels. Our last complaint was that the lighter for the propane grill didn't work. Other than these things, however, we really enjoyed our stay. The express check-in option was very convenient, and the staff was very helpful and considerate. This cabin was everything that we needed for our 4th of July getaway. A wonderful weekend get- a-way! The cabin is perfect! I would recommend lighting by the hot tub, more towels, robes for hot tub would be nice but may add to cost so would rather have lower cost than a robe. The cabin is well kept but I would like to see better repair of blinds. Some of our pieces were missing so privacy in the great room was not so good at the sliding glass door.. I would still recommend it to someone and I would stay again! Thank you for all of your kind words! We here at Cabins USA work hard to make sure that each of our guests have the same great stay you enjoyed while vacationing in the Smokies. Thank you for letting us know about the blinds in the great room. Your comments have been forwarded to our maintenance department so that issue can be corrected. When you are ready to stay with us again, please mention you are a return guest for an additional discount. Thank you again for your review and we look forward to seeing you again soon! This was our second time staying within the last 6months, the one we stayed in last time was a Long Kiss Goodnight. Compared to the the last one we were not so pleased, there was no dishwasher, or throw blanket on the couch, no cooking utensils, and just did not seem cozy like the other cabin. The next time we are planning on bringing our family. Overall good but not great. Came here for a romantic getaway. The booking process was simple. Staff were pleasant, helpful and friendly as always. I always stay with Cabins USA when I make trips to the mountains. The cabin itself was just was needed: small but big enough for just us two. It's not too difficult to find (I was able to find it at night in the rain). It was clean and comfortable! The hot tub is a newer model and it is amazing! It is blocked from the view of other cabins. We attempted to use the gas grill but either we can't follow directions (very possible =P) or it isn't working. Bring plenty of clothes and extra linens if you're staying a few days because there isn't a washer/dryer. We were super pleased with our stay and plan to stay again! Perfect cabin for a couple getaway! Situated in a nice location with peaceful surroundings. The right size for a couple just needing a cozy place to stay and relax. Thank you for taking the time to let us know about your recent stay in Enchanted Moment and I am so happy to hear that everyone enjoyed their stay! We work hard to make sure that each of our guests have the same relaxing stay that you enjoyed while vacationing in the Smokies. When you are ready to stay with us again, please let our reservationists know you are a return guest for and additional discount. Thank you again for your review and we look forward to having you as our guest again! There were some spiderwebs inside. There was also a problem where the bed slid off it's frame and my wife scrapped her leg on it. Nothing serious at all. It would have been nice to have a broom. The little "berries" (seeds, or whatever they were) dropped on the porch and were sticky, so we kept tracking them in the cabin. It would be nice to be able to sweep them out. Me and my fiancee love visiting Tennessee /Gatlinburg . This is the first time we have stayed with USA Cabins and we had an amazing time. The hot tub has a privacy fence which is great, it was very clean warm and ready for us to get right in when we got there, the bed was very comfy and the cabin was very clean. 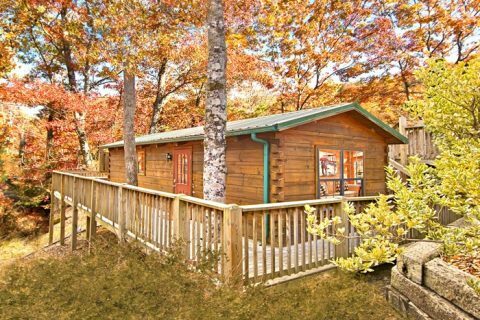 The only complaint is that the cabins are so close that you can hear your neighbors so if you can hear them guess what they definitely hear you. The cabin was a little hard to find( its a little tucked off on a very narrow drive) but well worth the money paid! Check in was easy and quick and so was check out, we had no issues at all. We will definitely be back! Thank you for your kind review! Our housekeepers and maintenance departments work hard to make sure that each of our cabins are thoroughly cleaned and fully stocked, so you can relax and enjoy the beauty of the mountains. When you're ready to visit our area again, please give one of our reservationists a call. They are always more than happy to help our guests find the perfect cabin...whether you're looking for that great mountain view or something a little more private. Thank you again for your review and thank you for choosing Cabins USA! I recently booked a stay with USA CABINS, and I stayed at A cabin entitled Enchanted Moments. Upon arrival my fiancé and I were greeted at the office and directed to our cabin. Which was conveniently located within 10 mins from all the attractions a family or couple could ever wish for, yet secluded enough to give you the feeling that your deep in the country. We planned our wedding / Honeymoon around our stay . And I must say for us there couldn't have been a more pleasant experience. My wife and I would both recommend USA CABINS for any and all vacation stays.. Paul & Missi Good !!!!! Everything was great, except the bed, it was very uncomfortable. But We will be staying again sometime trying out other cabins. Thanks! Thank you for choosing Cabins USA. We are glad that you enjoyed your stay with us at Enchanted Moment. We appreciate your feedback on your stay, and we look forward to hearing from you soon. Don't forget to call and ask about our return guest discount. My wife and I enjoyed our stay very much. It was just the two of us that stayed for a long weekend, stress reliever. We will be staying here again. Thank you so much Cabins USA. This cabin was perfect for my family and exceeded out expectations! We will definitely be back!